I just discovered the other day that Tin House Books is offering a set of four of their books for $35.99 via their website as The Tin House Writers' Series. 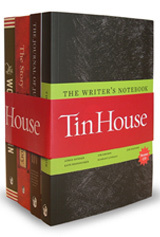 This is a wonderful deal: The Writer's Notebook: Craft Essays from Tin House; The Story about the Story, a collection of thirty essays; The World Within, a collection of interviews; and The Journals of Jules Renard, which was the subject of one of my personal favorites among my Strange Horizons columns. I'm planning to use the bundle as an assigned text for a course I'm teaching in the fall, "Writing and the Creative Process" because the content is varied and high quality and the price still allows me to assign another book if need be (I'm thinking of perhaps also using Lynda Barry's What It Is, but I'm still early in the planning process; a sales rep from Norton said he's sending me some things to look at, and he was friendly and knowledgeable, so I want to give those books a fair shake, too).